Chromosome mapping is a technique used in autosomal DNA testing which allows the testee to determine which segments of DNA came from which ancestor. In order to map DNA segments on specific chromosomes it is necessary to test a number of close family relatives. Ideally one should test both parents, one of their children, and a number of first to third cousins on both the maternal and paternal sides of the family. Not everyone has close relatives available for testing or has the funds to pay for such testing. Indeed, even if you did test all of your first and second cousins you might not be able to map your entire genome. In any case, the more first and second cousins you test, the higher the percentage of your genome that you can map, at least back to which parent or grandparent contributed any particular DNA segment. Mapping specific DNA segments to early ancestors is more challenging, particularly in endogamous (inter-married) populations. In such situations it is helpful to use a complementary technique known as triangulation. This involves finding other distant cousins who share the same segment and who share the same common ancestor. The caveat is that without chromosome mapping you cannot be sure that the documented common ancestor is the one who provided the shared DNA segment. The more matches who share both a specific DNA segment and a specific ancestor with you, the higher the probability that the DNA segment came from the common ancestor. 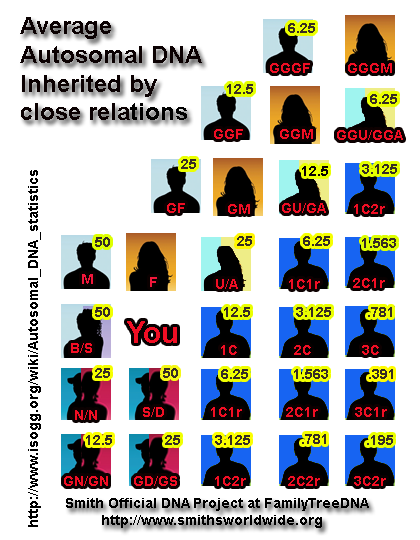 One should be particularly cautious about mapping segments to people who are related to you at no closer than about the 6th cousin level without additional corroborating evidence, such as two or more people who share the same segment with you (or your parents) and who also share the same common ancestor. Good link from ISOGG to show the simple mathematical average of sharing for autosomal.